Not to be confused with the Wrangell Mountains or Wrangell–St. Elias National Park and Preserve, farther northwest in Alaska. The City and Borough of Wrangell (Tlingit: Ḵaachx̱aana.áakʼw) is a borough in the Alaska, United States. As of the 2010 census the population was 2,369, up from 2,308 in 2000. Incorporated as a Unified Home Rule Borough on May 30, 2008, Wrangell was previously a city in the Wrangell-Petersburg Census Area (afterwards renamed the Petersburg Census Area (the Petersburg Borough was formed from part of this census area)). Its Tlingit name is Ḵaachx̱aana.áakʼw ("Ḵaachx̱ans Little Lake" with áa-kʼw 'lake-diminutive'). The Tlingit people residing in the Wrangell area, who were there centuries before Europeans, call themselves the Shtaxʼhéen Ḵwáan after the nearby Stikine River. Alternately they use the autonym Shxʼát Ḵwáan, where the meaning of shxʼát is unknown. The central (urban) part of Wrangell is located at 56°28′15″N 132°22′36″W﻿ / ﻿56.47083°N 132.37667°W﻿ / 56.47083; -132.37667, in the northwest corner of Wrangell Island, whereas the borough now encompasses the entire eastern half of the former Wrangell-Petersburg Census Area, in addition to the area around Meyers Chuck, which was formerly in the Prince of Wales-Outer Ketchikan Census Area. It also includes Thoms Place, a former census-designated place on Wrangell Island. Tlingit people and their ancestors have inhabited this island for thousands of years. According to Naanyaa.aayí clan traditions, Tlingit people migrated down the Stikine River during a time when the river still flowed underneath glaciers. The population slowly moved down the river, settling in different locations such as Tlákw.aan "Ancient Village", Sʼiknáx̱ "Across from the Grass", Shaal.aan "Fish Trap Town", Xakw.aan "Sandbar Village", and Kayáash "Platform", Hehl (Xel/Xehl) "Foam People", Hehl being the senior of house of the village. Later settlements on the coast included Chʼuxʼáasʼaan "Waterfall Town" (now Mill Creek), Ḵeishangita.aan "Red Alder Head Village" (site of the Wrangell Institute at Shoemaker Bay), Kʼaatsʼḵu Noow "Among the Sharps Fort" (now Anita Bay), An.áan "Village that Rests" (now Anan Bear Viewing Area), and many others. The numerous petroglyphs found at Petroglyph Beach just north of Wrangell, as well as those scattered on the beaches of the many islands in the vicinity, attest to the long Tlingit presence. It is also known and somewhat forgotten, that first peoples coastal migration to the Stikine River happened from the south. The Nass River people had several migrations into the area. 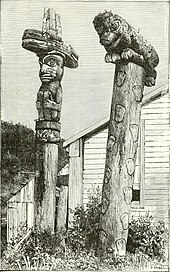 The "Git Setti" people tell of their migration story in a totem raised in Wrangell in 1894 called "Kickssetti" Totem. The salt water inlet that is now Wrangell Harbor was traditionally called Ḵaachx̱ana.áakʼw, literally "Ḵaachx̱án's little lake". Before the harbor mouth was dredged and cleared in the late 19th century, the mouth of this inlet would often go dry at low tide, which led to its being called a lake. Ḵaachx̱án was a man from the village variously known as Ḵaalchʼalʼaan (Kotzlitzan) or Chʼaalʼít.aan, meaning "Willow House Village"; or Shaax̱ít.aan meaning "Driftwood House Village." The village site today is known as "Old Town" or "Old Wrangell" (located at 56°12′28″N 132°16′22″W﻿ / ﻿56.20778°N 132.27278°W﻿ / 56.20778; -132.27278). Ḵaachx̱án was supposedly a hermit who preferred living away from his relatives, and lived in a smokehouse located on the rear shore of the lake, which was named after him. Village of Wrangel Alaska (Tlingit: Ḵaachx̱aana.áakʼw) in 1868, present-day Front Street. Wrangell was founded by Russians as one of the oldest non-Native settlements in Alaska. They started trading for furs with area Tlingit in 1811 at the site of present-day Wrangell. In 1834, Baron Ferdinand Petrovich Wrangel, then head of Russian government interests in Russian America, ordered a stockade built near the Naanyaa.aayí clan house of Chief Shakes, called Shéiksh Hídi. This house was located about 13 miles (21 km) north of Old Wrangell, on a small island in the middle of what is today Wrangell Harbor. The stockade, named Redoubt Saint Dionysius (Редутъ Санктъ Дионисіусъ), was founded at the location of present-day Wrangell and stood near the end of the small peninsula that forms the northeastern side of the mouth of the harbor. The British Hudson's Bay Company (HBC) leased the fort in 1839 and named the stockade Fort Stikine. The Tlingit had used the Stikine River as a trade route to the interior since ancient times, and they protested when the Hudson's Bay Company began to use their trade routes. Two epidemics of smallpox in 1836 and 1840 sharply reduced the Tlingit population in the area by half, as they had no acquired immunity, and silenced most of the protest. The HBC abandoned the fort in 1849 after the area's stocks of sea otter and beaver were depleted, ending the fur trade. Fort Stikine remained under British rule until Alaska's purchase by the United States in 1867. In 1868, the U.S. built a military post called Fort Wrangell at the site, and it remained active until 1877. The community around the post continued to grow through commerce with prospectors in the gold rushes of 1861, 1874–77, and 1897. As in Skagway, businessmen looking to make money off the miners built many gambling halls, dance halls, and bars. Thousands of miners traveled up the Stikine River into the Cassiar District of British Columbia during 1874, and again to the Klondike in 1897. The Wrangell Bombardment occurred on the 25th of December 1869 when a Stikine Indian named Lowan bit off Mrs. Jaboc Muller's third right finger, and was killed in an ensuing fight by soldiers who mortally wounded an additional Stikine Indian. The following morning, Scutd-doo, who was the father of the deceased, entered the fort and shot the post trader's partner Leon Smith fourteen times. Smith died some 13 hours later. The US army made an ultimatum demanding Sccutd-doo's surrender, and following bombardment of the Stikine Indian village, the villagers handed Scutd-doo over to the military in the fort, where he was court-martialed and publicly hanged before the garrison and assembled natives on 29 December, stating before he was hanged that he had acted in revenge against the occupants of the fort for the killing of Lowan and not against Smith in particular. In 1877, the first Presbyterian church in Alaska, the first Protestant church of any kind in the area, was founded near its current location at 220 Church Street. Reverend S. Hall Young, a colleague of Sheldon Jackson, was assigned to the Wrangell mission and arrived on July 10, 1878. He worked among both miners and Tlingits. 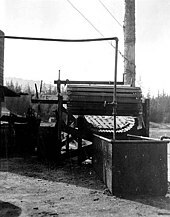 He established the Fort Wrangell Tlingit Industrial School to teach young Tlingit men various American trades, such as printing, boatbuilding, and construction. This institution was a parallel to Sheldon Jackson's Sitka Industrial Training School, which became Sheldon Jackson College. Young's school was the nucleus of the later Wrangell Institute, a boarding school for Alaska Natives through the mid-20th century. S. Hall Young was a friend and companion of the naturalist John Muir, who lived in Wrangell in 1879-1880. Muir and Young traveled up the Stikine River, as well as to Kake, Glacier Bay, and elsewhere in Southeast Alaska. Young and Muir were accompanied by two Stikine elite men, Tʼaawyaat ("Toyatte", lit. Long Feather), and Kaadaashaan ("Kadachan"), as well Sitka Charley, as a young man who was their interpreter in Chinook Jargon and English. The oldest Catholic Church in Alaska; St. Rose of Lima, was established at Wrangell May 4, 1879. 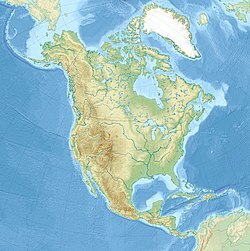 Having been Tlingit territory and then under the jurisdiction of Russia, Great Britain, and the United States, Wrangell has the unique status as the only Alaskan city to have been governed under four "flags". Fish traps were constructed in the late 1890s on the nearby mouth of the Stikine River and in the Zimovia Strait. 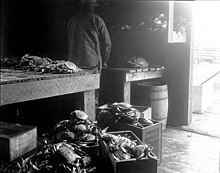 These contributed to the growth of the fishing and fish canning industries in Wrangell, which provided much of the economic life for the town before the rise of logging in the 1950s. The fish traps caused severe damage to the Stikine River salmon runs, reducing the number of fish that managed to spawn and causing a decline in salmon runs and fishing in the region. After statehood, the new government decommissioned all fish traps in Alaska. 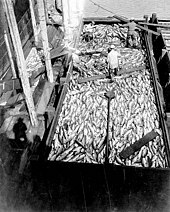 The fishing industry remained strong, and continues to be the primary occupation of many residents. The weekly newspaper, The Wrangell Sentinel, was founded in 1902, and printed its first issue on November 2 of that year. The newspaper remains in publication with only a few short periods of inactivity. It is the oldest continuously published newspaper in Alaska. The renowned Bear Totem Store, built in the 1920s by Walter Waters, housed innumerable examples of Tlingit arts and crafts, as well as a number of irreplaceable totem poles. Waters began his business career carrying mail by boat from Wrangell to Sulzer. During this period, he traveled throughout southeast Alaska as a fur buyer. While on business travels, Waters began to acquire Indian artifacts and make valuable contacts with Indian artisans. He eventually enabled him to open his curio shop, The Bear Totem Store. A severe fire in the early 1950s burned much of the downtown area, destroying the Bear Totem Store and most of its contents. Few historic buildings remained after the fire. The disaster dramatically changed the face of Wrangell, and with new buildings, the past was lost. Logging, fishing and tourism are the current mainstays of the Wrangell area economy. One of the last two major sawmills in southeast Alaska is operated by the Silver Bay Logging Company just south of the city proper. The community has always been a center of the Tlingit Kaach.àdi, Kiks.ádi and Naanyaa.aayí clans, as well as the only home of the Kayaashkiditaan, Sʼiknax̱.ádi, X̱ookʼeidí, Kaasx̱ʼagweidí, and Taalḵweidí clans. Chief Shakes Tribal House, which is known in Tlingit as Shéiksh Hídi "Shakes House", is a replica of traditional Tlingit houses. It was constructed by CCC crews in the 1930s of the Great Depression, according to traditional knowledge and methods. It stands at the original location of Shakes House, on Shakes Island inside Wrangell harbor. Today the Wrangell Cooperative Association, a Tlingit IRA council and the federally recognized tribe for the area, maintains Shakes Island and the House, as well as Totem Park near the city center. In an election held on May 6, 2008, to decide whether to upgrade from city to borough status, 63.99% of the votes were in favor of borough status. On May 30, 2008, Wrangell was reincorporated as the City and Borough of Wrangell. Canadian American Donald McConachie Sr. was the CBW's first mayor. He was succeeded by Jeremy M. Maxand, but was elected in 2012 as mayor again after Maxand declined to seek reelection. The Wrangell Cooperative Association has commissioned a team to restore Chief Shakes House and the totems at Totem Park. It consists of a master carver, Wayne Price, and six assistants, four of them women accepted after intensive training in the use of the traditional adze tool. Wrangell is located on the northern tip of Wrangell Island, an island in the Alaska Panhandle. It is 155 miles (250 km) south of the Alaskan capital of Juneau. It is across the narrow Zimovia Strait from the mouth of the Stikine River on the Alaska mainland. The town is named after the island, which was named after Ferdinand Petrovich Wrangel, a Russian explorer and the administrator of the Russian-American Company from 1830 to 1835. Per the 2010 United States Census, the borough has a total area of 3,462 square miles (8,970 km2), of which 2,541 square miles (6,580 km2) is land and 921 square miles (2,390 km2) is water. This is larger than the former City of Wrangell, which as of the 2000 census had a total area of 70.844 square miles (183.5 km2), of which 45.278 square miles (117.27 km2) was land and 25.566 square miles (66.2 km2) was water. According to the Köppen climate classification system, Wrangell has a humid continental climate (Dfb). The primary industry of the city is fishing. 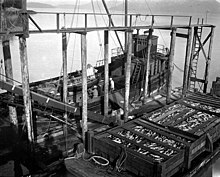 A commercial fishing fleet is harbored in Wrangell and several sports fishing guiding services operate here as well taking tourists and wilderness adventurers to remote locations on the great Stikine River[better source needed] branching eastward into British Columbia. Boatyards have increased in scale allowing storage and repairs of larger vessels. The city has a picturesque golf course with a view of Mt. Wrangell. Like many S.E. Alaskan communities state government spending is important to the local economy, though not to the extent of Juneau-the state capitol. The Federal government also kicks in a share with the forest service, postal service and homeland security operations expenditures. The southernmost terminus of the vast Juneau ice field is just north of the Stikine with several glaciers flowing down to the river and saltwater at Laconte Bay. [better source needed] Though Chinook salmon have been devastated by commercial over-harvesting recently and the fishery was largely closed in spring 2018, hope for its recovery abounds since fisheries have crashed in S.E. Alaska recurrently over history and recovered. Whales live seasonally in the waters of the Alexander Archipelago and visit Wrangell searching for herring and salmon creating good photo opportunities. The former vast Alaska Pulp Corporation logging operations at Wrangell closed down in the mid-1990s unable to meet water quality standards though cutting hundreds of millions of board feet of lumber annually. Wrangell has three marinas on the northwest side of the island and the southernmost; Shoemaker Bay, is undergoing renewal construction in September 2018. A Tlingit cultural center and museum is located on the waterfront of Wrangell. In order to keep a small-town rural aesthetic the city turned down the prospect of building a state prison and home-porting a naval vessel. The Stikine Inn was remodeled to fine shape, and an inter-island ferry business was established with service to Prince of Whales Island. Sunrise aviation- an air work and tourism float plane service, continues to provide service anywhere in the region, though helicopter journeys to high mountain glaciers need to be scheduled from Ketchikan to the south 100 miles (Ketchikan is from the Tlingit word Kootchikan meaning place of stinky fish). Baron Von Wrangell sent Lieutenant Dionysius Zarembo to establish a trading post on Stikine Strait in 1833 to beat the Brits. 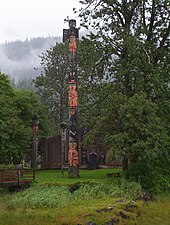 Tlingits apparently were receptive to British and Russian traders. [better source needed] Today nearby Zarembo island has an elk and moose population visited by hunting guides and parties from Wrangell. A marijuana sales business was placed in the back of a restaurant downtown. Alaska Airlines creates a few local jobs with twice daily service to Seattle and Juneau, Ketchikan, Sitka and other S.E. destinations and the Alaska Marine Highway system has a terminal with a few workers where dock ferryboats, near the Stikine Inn. Wrangell's seafood processing plant, though small and consuming much of the city's water supply seasonally, has employed workers from Mexico, Russia and Somalia in recent years. Wrangell has several churches and bars and a pizza store though no citywide free wireless internet for tourists or business travelers yet. The local Native Corporation—the Sealaska Corporation, contributes to the cost of local health care provisioning. The former mill site of the Alaska Pulp Corporation that was dismantled has some use sending logs and boulders via ships and a prospect for development as a cruise ship site with multipurpose western theme shops and dark ale brewery for export. The city has expanded its electrical power lines a mile and a half south on Isheyami Drive to allow a concrete production facility to power up (they bring in sand via barge from the Stikine River). Wrangell first appeared as an unincorporated village on the 1880 U.S. Census. It featured 106 residents, of which 105 were White and 1 was Creole (Mixed Russian & Native). In 1890, it returned 316 residents, of which a majority, 228, were Native, 71 were White, 15 Creole, 1 Asian and 1 Other. This also included the Chantay farming settlement & Labouchere Cannery. In 1900, it became the 5th largest community in Alaska with 868 residents (though the racial breakdown was unspecified). In 1903, Wrangell formally incorporated. 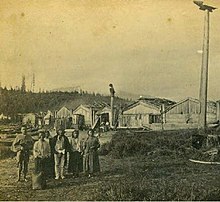 In 1910, it fell to 10th largest city in Alaska and returned 743 residents, with 419 Whites, 249 Natives and 75 Others. In 1920, it had 821 residents and remained the 10th largest city. In 1930, it was the 9th largest city with 948 residents. In 1940, it rose to 8th place. In addition to the 1,162 residents, the census also reported a separate 163 individuals living in the unincorporated areas surrounding Wrangell. The combined number of 1,325 would've placed it just ahead of 7th place Petersburg (with 1,323 residents). Beginning in 1950, Wrangell fell out of the top 10 largest communities in Alaska. In 2008, Wrangell became a separate city & borough. As of the census of 2000, there were 2,308 people, 907 households, and 623 families residing in the city. The population density was 51.0 people per square mile (19.7/km²). There were 1,092 housing units at an average density of 24.1 per square mile (9.3/km²). The racial makeup of the city was 1696 White, 3 Black or African American, 358 Native American, 15 Asian, 3 Pacific Islander, 8 from other races, and 9.75% from two or more races. 23 of the population were Hispanic or Latino of any race. There were 907 households out of which 35.7% had children under the age of 18 living with them, 54.9% were married couples living together, 9.4% had a female householder with no husband present, and 31.3% were non-families. 26.5% of all households were made up of individuals and 9.6% had someone living alone who was 65 years of age or older. The average household size was 2.52 and the average family size was 3.05. In the city, the population was spread out with 29.4% under the age of 18, 5.2% from 18 to 24, 27.3% from 25 to 44, 26.4% from 45 to 64, and 11.7% who were 65 years of age or older. The median age was 39 years. For every 100 females, there were 106.1 males. For every 100 females age 18 and over, there were 102.7 males. The median income for a household in the city was $43,250, and the median income for a family was $54,167. Males had a median income of $43,846 versus $29,205 for females. The per capita income for the city was $21,851. About 7.3% of families and 9.0% of the population were below the poverty line, including 11.0% of those under age 18 and 9.3% of those age 65 or over. The Wrangell Institute was an American Indian boarding school opened in 1932, which closed in 1975. The Wrangell Medical Center hospital is owned by the City and Borough of Wrangell and governed by a board of directors elected by residents. The Wrangell Medical Center is a critical access hospital and long term care facility with a total of 22 beds, 8 for acute care and 14 for long term care. Emergency care, inpatient care, imaging, lab, and physical therapy are provided by the center. Visiting specialists in internal medicine, obstetrics/gynecology, optometry, pediatrics, ophthalmology, podiatry, orthopedics, rheumatology and dermatology compliment local services. Alaska Island Community Services was established in Wrangell in 1989 under the original name Wrangell Community Services, and began providing Core Mental Health Services to the Community of Wrangell. Over the next two decades the delivery of services expanded to include Disability and Senior Services, rehabilitative wilderness experience for youth, Primary Care Health Care, Dental Services, and a Pharmacy Department. As a federally qualified health center, all of the services are provided on a sliding fee discount scale based on federal guidelines. Southeast Alaska Regional Health Consortium is a non-profit medical, dental, vision and mental health organization serving the health interests of the residents of Southeast Alaska. In 2017 SEARHC merged with local non-profit Alaska Island Community Services to form AICS, a Division of Searhc. The newspaper for the borough is The Wrangell Sentinel, which is the oldest continuously published newspaper in Alaska, having been in print since 1902. Its sister-paper is the Petersburg Pilot in the City of Petersburg. People at Wrangell also read the Juneau Empire and Alaska Dispatch on-line. Wrangell is served by two radio stations: KSTK broadcasts Public Radio format, while KWRG-LP broadcasts a Christian format. Being located on Wrangell island, Wrangell has two basics forms of transportation: ferry and airplane. While on the island, a network of paved roads and multiple miles of logging trails remain. The Alaska Marine Highway serves Wrangell on its Inside Passage route with regular northbound and southbound stops that link it to the rest of Southeast Alaska. Wrangell is also a stop on the summer Monday, Friday, & Saturday runs of the Inter-Island Ferry Authority's M/V Stikine. Its round-trip run originates in Coffman Cove on Prince of Wales Island, continues on to Wrangell, and Petersburg as the furthest stop, returning to Wrangell, and Ketchikan. Wrangell also receives two daily scheduled Boeing 737-700/800 passenger jet service operated by Alaska Airlines at the Wrangell Airport. One plane in the morning and one plane in the evening. Sunrise Aviation provides float plane service to the region. The primary road is the Zimovia (means winter strait in Russian) highway which runs along the west side of the island for 14 miles. Apart from the highway and most roads in town, the rest are unpaved, logging trails, forest service roads, and hiking trails. Isheyama Drive running on the east side south beyond the golf course is paved for two miles. At the former terminus of the road, a view spot of Eastern Passage for pedestrians takes off. Yet Ballard's, as it was named for a late fisherman, does not offer safe small boat landing at all. A logging road was made almost all the way through to Pat's Creek road 6 miles south bisecting the island east-west to Shoemaker Bay yet a half mile or less was left uncompleted during the last forest service timber harvest contract. The Reagan Road was suggest as a name for the future street. ^ 2015 Alaska Municipal Officials Directory. Juneau: Alaska Municipal League. 2015. p. 19. ^ a b c d "Certificate of Incorporation of the City and Borough of Wrangell" (PDF). Alaska Department of Commerce, Community and Economic Development, Division of Community and Regional Affairs (DCRA). May 30, 2008. Retrieved May 4, 2012. ^ "State & County QuickFacts". United States Census Bureau. Retrieved May 18, 2014. ^ Young, S. Hall. 1927. Hall Young of Alaska. Fleming Revell. ^ Muir, John. 1909. Stickeen: An Adventure with a Dog and a Glacier. Boston: Houghton Mifflin. ^ Muir, John. 1915. Travels in Alaska. Boston: Houghton Mifflin. ^ "Traditional Tlingit Map and Tribal List". Tlingit Readers, Inc. Retrieved 2009-06-21. ^ "2008 Wrangel Incorporation Election: May 6, 2008: Official Results" (PDF). Division of Elections. State of Alaska. May 30, 2008. Archived from the original (PDF) on April 8, 2010. ^ Miller, Mark (4 October 2012). "Wrangell race tips to McConachie - by 2 votes". Juneau Empire. Retrieved 15 October 2012. ^ "Counties (2010): Alaska" (TXT). 2010 Census Gazetteer Files. United States Census Bureau. Retrieved January 24, 2013. ^ "Places (2010): Alaska" (TXT). 2010 Census Gazetteer Files. United States Census Bureau. Retrieved January 24, 2013. ^ "Places (2000)" (Zipped TXT). 2000 Census Gazetteer Files. United States Census Bureau. Retrieved January 24, 2013. ^ "WRANGELL (509919)". Western Regional Climate Center. Retrieved November 18, 2015. ^ "Post Office Mural-Wrangell, AK". livingnewdeal.org. Living New Deal. Retrieved 27 April 2016. ^ "State of Alaska ferries". Alaska Marine Highway System. ^ "Northern Route Schedule". Inter-Island Ferry Authority.